Take your yoga practice to the barn with these horseback moves. Yoga has worked its way into the fabric of modern culture, and with good reason: Studies suggest regular yoga practice offers a wide variety of mental and physical benefits. With the mind-body connection yoga brings, the physical benefits include increased flexibility, strength and circulation, as well as protective effects on the spine, cartilage and joints. Additionally, attention to breath and centeredness facilitates a quieter mental and emotional space. 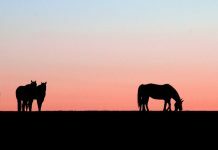 How about all this while spending time with your horse? A true win-win! 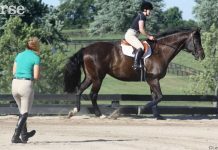 Equestrian yoga, an ancient tradition with a modern twist, takes the practice away from the studio and into the barn: this is yoga done together with your horse. Danny Chapparo of Ashva Yoga in Castle Rock, Colo., shows us how. Tree Pose: Breathe while envisioning energy coming from the earth through your body to your heart center, and then from your heart to your horse. 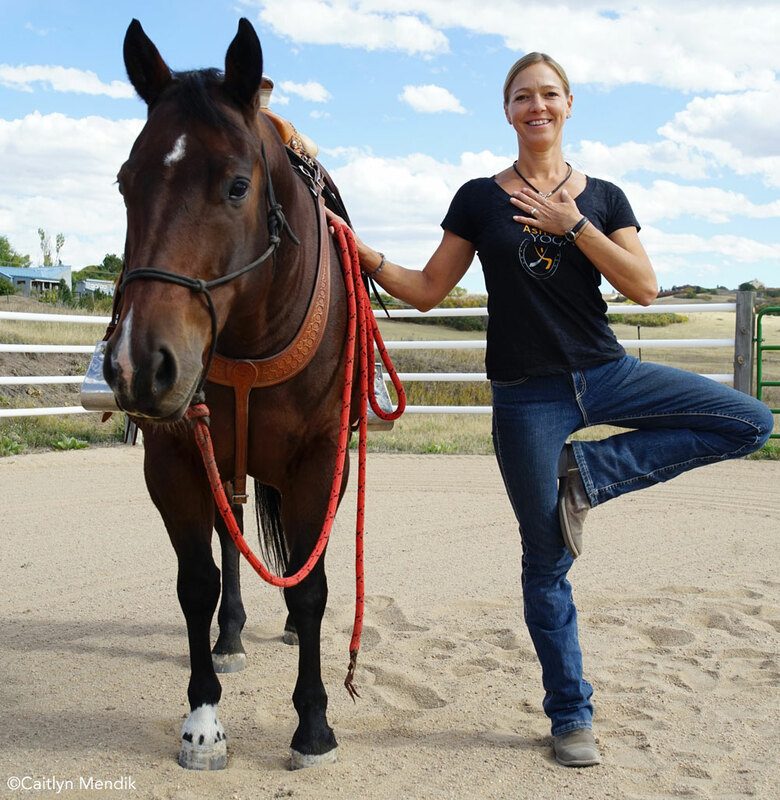 Tree Pose: Standing next to your horse while facing the same direction, place your hand closest to the horse on his shoulder or chest. Balancing on your leg closest to the horse, bend your other leg at the knee, placing the sole on your opposite inner shin or inner thigh (avoid resting your foot against your knee, as pressure on the knee can cause injury). Bring your free hand to your heart, envisioning energy coming from the earth, through your body to your heart center, and then from your heart to your horse. Breathe. Perform this hip-opening, balancing pose on the other side of the horse as well. 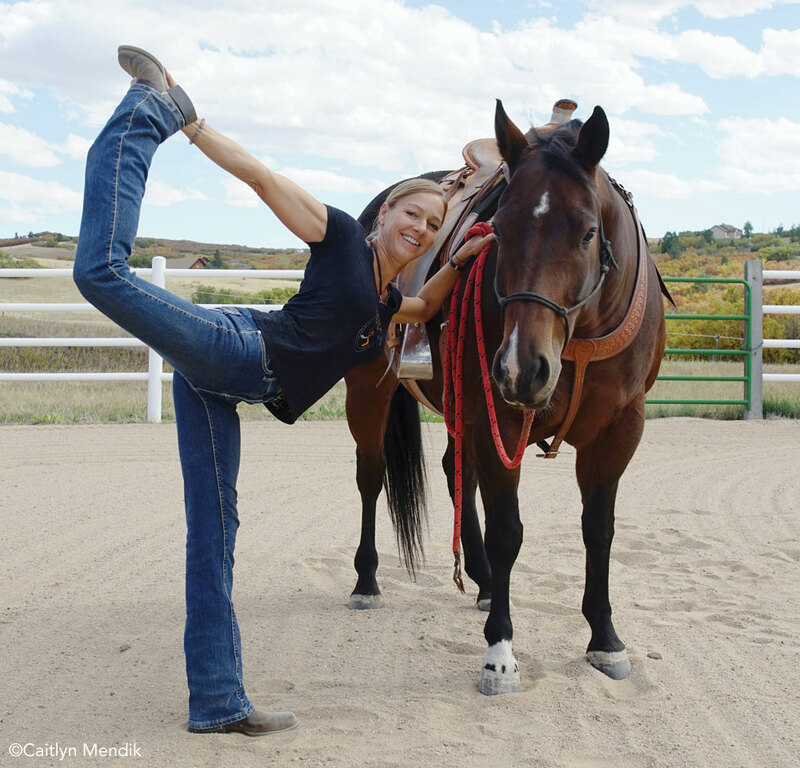 Dancer Pose: Feel the great thigh and shoulder stretch while bringing your heart closer to your horse. To modify, use a rope around your ankle. Dancer Pose: Stand facing your horse. 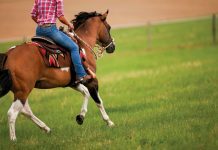 Place a hand on his shoulder and allow the leg on the same side of your body to sink down into the ground with your toes pointing toward the horse. Grasp your opposite foot, inhale, and lift your leg up behind you. Lean into your hand that’s on the horse, allowing your heart to come closer to the horse. Breathe, feeling the great thigh and shoulder stretch. Inhale and return to standing. If you can’t easily reach your foot, use a rope or towel around your ankle and hold it with your hand. Pigeon Pose: This deep stretch of your hips and gluteus should be done with a neutral back. 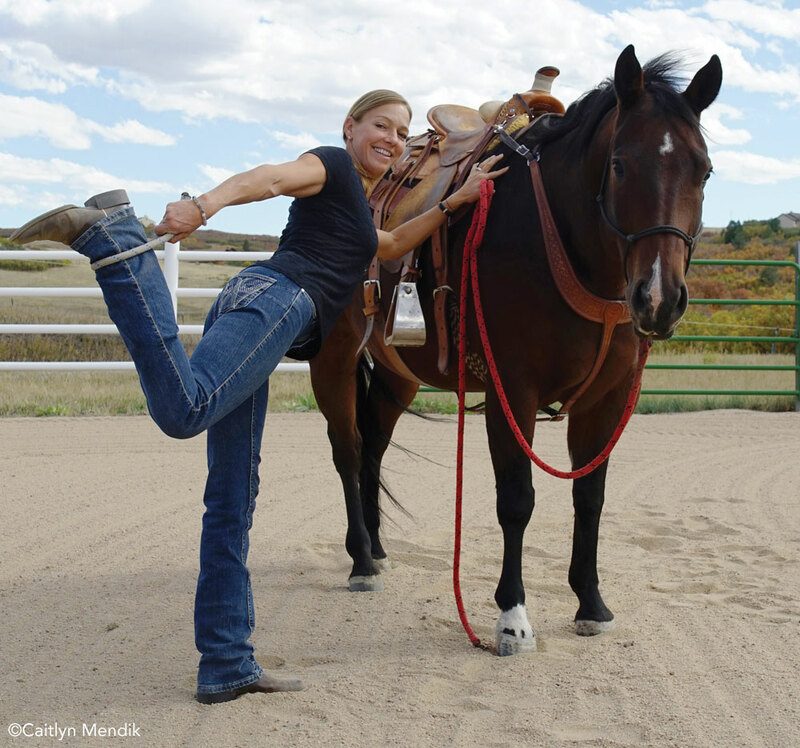 Pigeon Pose: Stand facing your horse and lightly grab on to the stirrup with both hands. Bring your ankle up and place it just above the opposite knee, keeping the flexion in your crossed foot, which protects your knee from rotation. With your lower back in a neutral position, sink into your bent standing leg. Breathe, feeling the stretch in your hips and gluteus. Repeat on the other side. Triangle Pose: Begin in a wide stance with your ankles and wrists aligned in two imaginary parallel lines. Hinging from the hip, reach your hand downward to either the shin, knee or thigh depending on your flexibility. Stretch your opposite arm upward with your chest open. Be sure your front knee is turned forward to stretch through the inner thigh of your front leg. Your back leg is grounded through your heel; elongate from your lower back into your back leg, so you feel anchored in the pose. If your horse is standing quietly, lean your shoulder into his body and feel the connection. Look up to the sky for several breaths. Repeat on the other side. Dancer Pose: Grasp your ankle while your knee sinks toward the earth. Raise your opposite arm. Dancer Pose: While seated in the saddle, reach with one hand and grasp the foot on the same side of your body. Inhale, bend at the knee, and bring your foot up toward you, allowing your knee to reach down towards the earth. Draw your belly in with your core muscles so the stretch is through your front thigh, not your lower back. Use a strap around your foot or hold on to your pants if you can’t quite catch your leg. Breathe deeply. Repeat on the other side. Pigeon Pose: Bring your flexed foot in front of the pommel of the saddle and lean forward, being careful not to catch the reins. Pigeon Pose: While mounted, place a flexed foot in front of the horn or pommel of the saddle, resting your foot at the base of the horse’s neck, being careful to not catch the reins. Lean forward, keeping your seat bones in the saddle. Your hip and thigh open as your knee stretches out and down. Breathe and sink into the stretch. Repeat on the other side. If you are comfortable, try this pose at the walk to enhance your balance, staying centered on your seat bones. 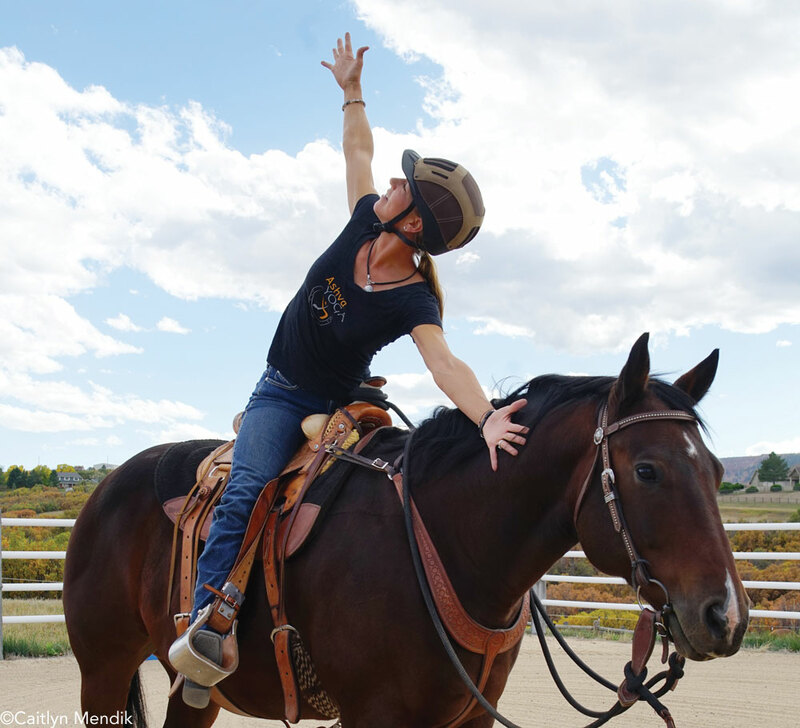 Resolved Triangle Pose: Reach forward to the opposite side of your horse’s neck with one hand while extending the other arm up. Resolved Triangle Pose: While mounted, twist at the waist, reaching forward to touch your horse’s neck or withers with the back of your hand on the opposite side. Extend your other arm up, opening your chest and shoulders, feeling the nice lateral stretch and spine rotation. Breathe and keep twisting while staying centered in your pelvis. Repeat on the other side. Cow-Face Pose: Open tight shoulders by pulling your arms apart behind your back. Engage your core so your back doesn’t arch. Use a rope or cloth to modify if your hands don’t touch. 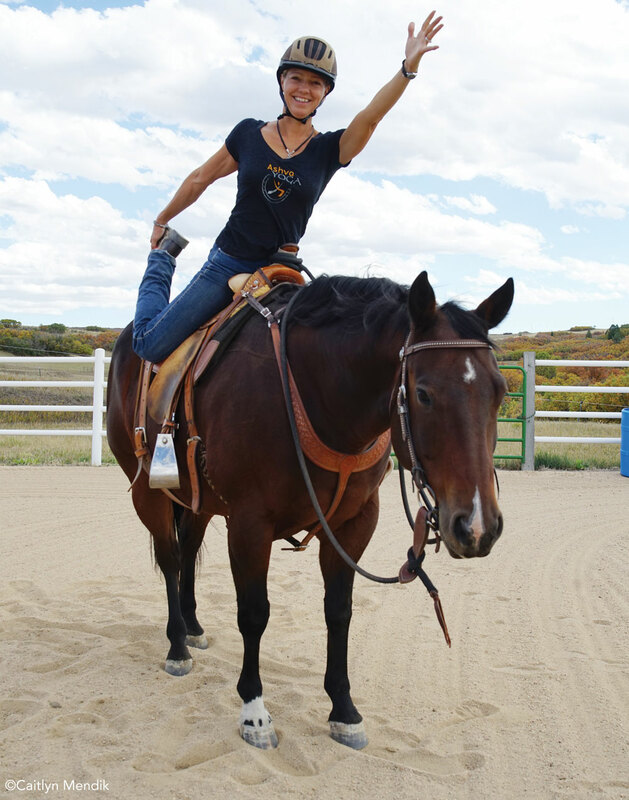 Cow-face Pose: To open tight shoulders, reach one hand upward while seated in the saddle. Bend your extended arm at the elbow and let it drape behind your neck. With the opposite arm, reach behind your back from below and stretch up toward the fingertips of your opposite hand. If your fingertips don’t touch, use a rope or cloth to hold. Gently pull away from each other, so one elbow reaches up towards the sky and the other reaches down to the earth. Engage your core so your back doesn’t arch. Breathe and enjoy the stretch. Repeat on the other side. Camel Pose: Squeeze your shoulder blades together and open your chest with hands behind you, either on the cantle or horse’s rump. Camel Pose: Place your hands behind you on the horse or on the saddle. Squeeze your shoulder blades together, drawing your elbows closer together and breathe deeply, spreading collarbones wide. Keep your seat bones rooted in the saddle. Look up if it feels good through your neck.